US almond and pistachio producers continue to benefit from growth in international consumption, while walnut producers have endured a sharp drop in demand across key global markets, according to Farmer Mac. 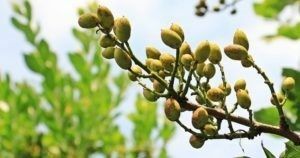 In a report in its quarterly agricultural outlook The Feed, Farmer Mac examined the 60 percent increase in US acres planted with almonds, pistachios and walnuts since 2007 and described recent developments relevant to demand for each crop. For almonds, Farmer Mac wrote that despite inconsistent and freezing temperatures, the USDA is currently expecting a 7 percent increase in US acres planted with the crop this year. The report cites the California Almond Board’s reports of a 6.6 percent year-on-year increase in domestic demand and 14 percent year-to-date growth in almond exports to demonstrate that consumers’ desire for tree nuts has kept pace with increasing production. India and China have emerged as especially important export markets for US almond producers, with each country having seen a more than 20 percent increase in imports from the US this marketing year alone. “Almonds were one of several agricultural commodities affected by the recent Chinese tariff increased in response to proposed US steel and aluminum tariffs. The industry will be keeping a close eye on whether an increase in the Chinese tariff on almonds, (from 10 to 25 percent), will have a significant effect on demand,” wrote Kuhns. A fund manager with tree nut investments echoed to Agri Investor in an email that trade is a growing concern with the market. While export markets have been increasingly important in shaping the fates of US almond producers, Kuhns wrote that it is an 11 percent increase in domestic pistachio consumption that has proven the most significant recent development in that market. Though exports have accounted for three fifths of pistachio shipments over the past five years, because pistachio yields generally vary year to year, Kuhns told Agri Investor that the surge in domestic demand is particularly well-timed due to a larger than expected off-year crop in 2017. In the report, Kuhns wrote that the current marketing year has seen a 17 percent decrease in walnut exports, with declines down across key markets in Europe, the Middle East, Africa and Asia. Stressing the fact that that dependable data is very hard to come by, Kuhns said that institutional investors have generally favored almonds and pistachios over walnuts, in part because fewer acres of walnut orchards have come onto the market. While the dip in international demand facing US walnut producers is significant, Kuhns said, that comes after a record year and was influenced in part by a recent uptick in prices. “It’s not to say that it’s not still good, it’s just not as good as it has been,” said Kuhns. Kuhns said that the recent increase in overall tree nut production in California fits into a wider pattern of producers gradually moving from grains into higher value crops over the past 100 years. While private investors have played a role in that shift, Kuhns said, so too have individual producers looking to make the most of their land amid rising values. Never underestimate the importance of accuracy or the significance of every action and interaction that contributes to our reputation for excellence in the marketplace.